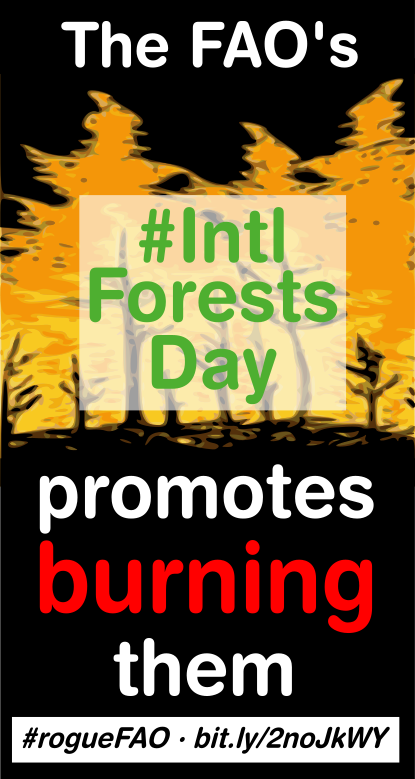 21st March has been declared International Day for Forests by the UN. 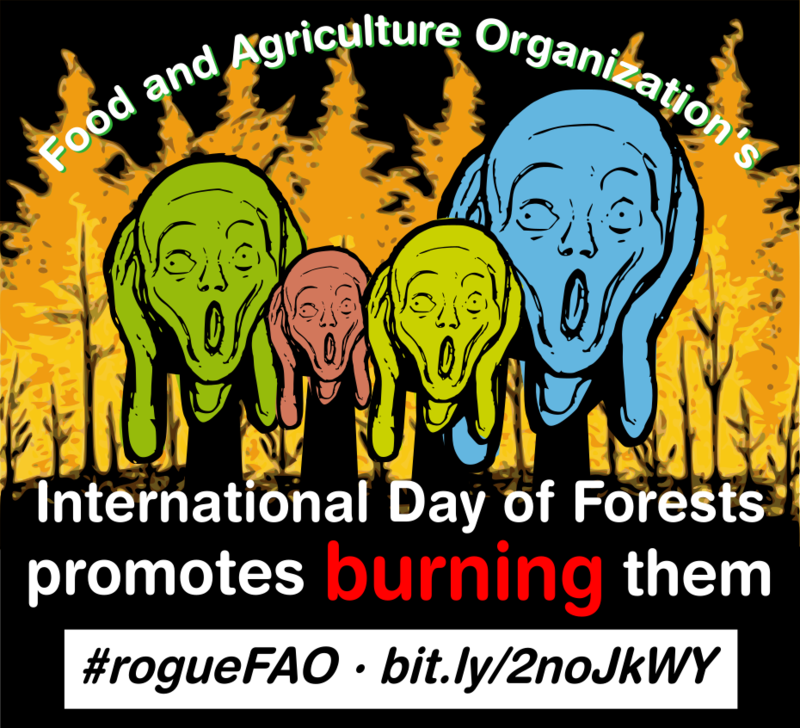 Shockingly, the UN’s Food and Agriculture Organisation (FAO) has decided to mark the day by promoting “Forests and Energy”, i.e. wood-based bioenergy, despite its well-documented harm to forests worldwide. This is a collaborative webpage by Global Forest Coalition, Timberwatch, Biofuelwatch, International Tree Foundation, and Dogwood Alliance. 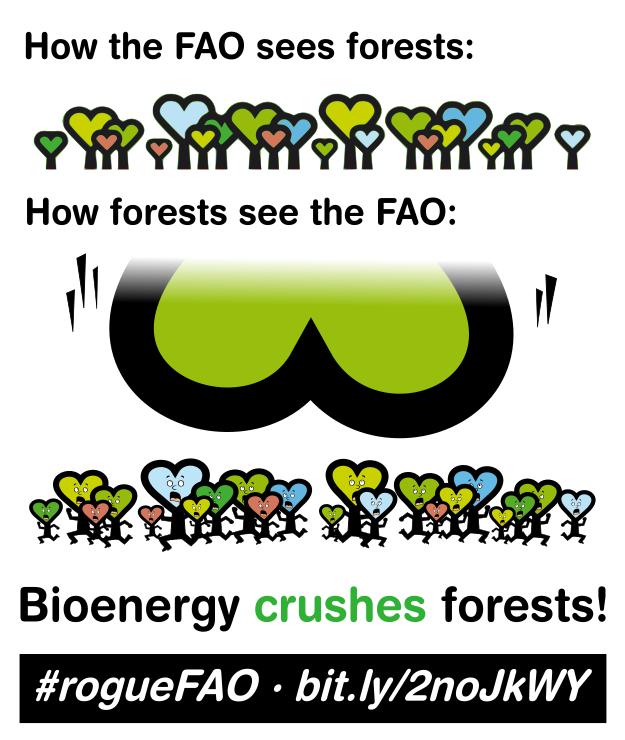 If you like, you can also put eubioenergy.com/ as a link in your tweets, since the Open Letter to the FAO will be published there, too. The theme “Forests and Energy” chosen by the UN Food and Agriculture Organization (FAO) for this year’s International Day of Forests on 21 March, is dangerous and misleading. It is a barely concealed advertisement for the bioenergy industry, and shows a naked disregard for international efforts – including its own – to promote sustainable development and tackle climate change. It represents a bonfire of science and nature in which only Trump and his collaborators would find comfort and warmth. The FAO highlights the fact that people around the world have long relied on wood for basic cooking and heating needs. But it then further presents modern industrial bioenergy – which includes the conversion of large coal fired power plants to burning wood, as well as the proposed used of wood based biofuels for transportation and aviation – as a natural extension of those long-held traditional wood use practices. 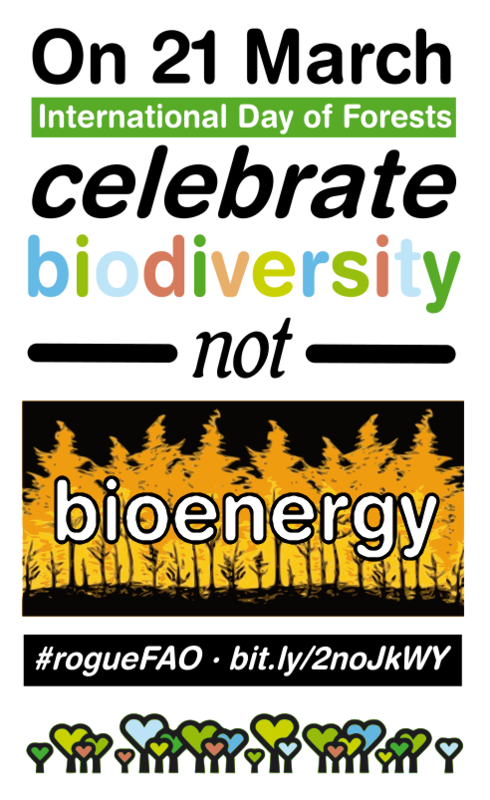 Conflating traditional and modern industrial uses of wood bioenergy is disingenuous and undermines the thoughtful consideration that is required to develop energy and other policies that will protect forests, people and the planet. Modern industrial scale wood bioenergy is supported by lucrative subsidies as a “renewable” alternative to coal or other fossil fuels. It is falsely referred to as “carbon neutral” in spite of clear evidence to the contrary indicating that burning wood releases even more carbon emissions upfront than the fossil fuels it is supposed to replace. 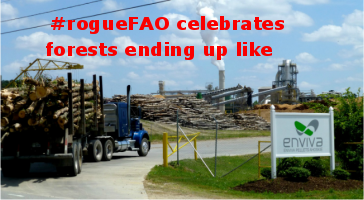 Industrial scale wood bioenergy requires such vast quantities of wood that demand can never be met “sustainably”. As one example, the DRAX coal plant in United Kingdom, which is converting to burn wood, with generous government subsidies, requires the import of more than 12 million tonnes of wood pellets annually – more than the total wood production of the UK. (see biofuelwatch.org.uk/axedrax-campaign/) . Demand for industrial scale wood-based bioenergy is already escalating deforestation and the conversion of native biodiverse forests into industrial monoculture tree plantations for “biomass production”. In some cases these directly displace people and compete with traditional uses for forests. Tree plantations are being actively subsidised and otherwise promoted as a preferred convenience for the wood products industries, including for wood-based bioenergy, but bear little resemblance to genuine forests. Instead, they tend to have significant negative impacts on biodiversity and rural communities. FAO, in spite of ongoing civil society pressure, continues to refer to them erroneously as “planted forests”, while civil society refers to them rather as “green deserts” or “fake forests”. By offering forests as a source of “renewable” energy and failing to differentiate between native biodiverse forests and monoculture tree plantations, the FAO appears to be paving the way to meet the demands of energy and forest product industries at the expense of protecting forests and human rights. That does not bode well especially given FAO’s key role in setting the agenda and particularly the target indicators related to sustainable forests and mountains, and land degradation, under the Sustainable Development Goals in Agenda 2030. 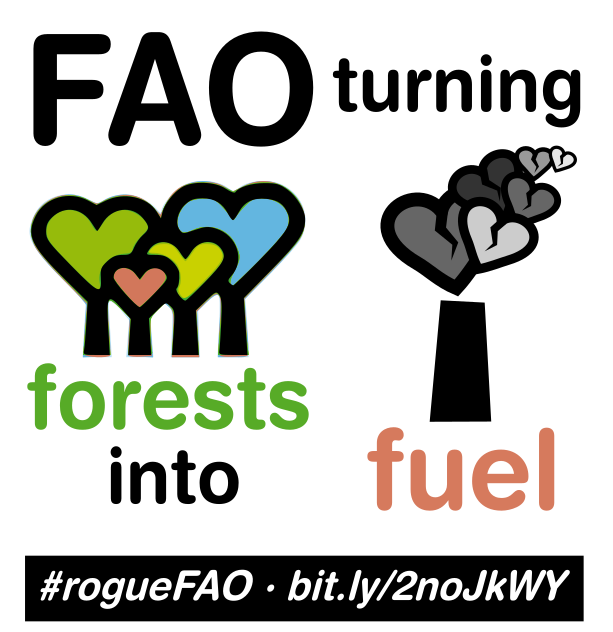 The FAO promotion of “forests as energy” is grossly inappropriate coming from a “food and agriculture” agency. It is also badly timed, given that we are squarely faced with the dual crises of biodiversity loss and climate change, and we know that forests left intact and growing rather than being burned for energy can play a vital role in averting these crises. + An Open Letter signed by over 200 civil society organisations has been handed over to representatives of the FAO. 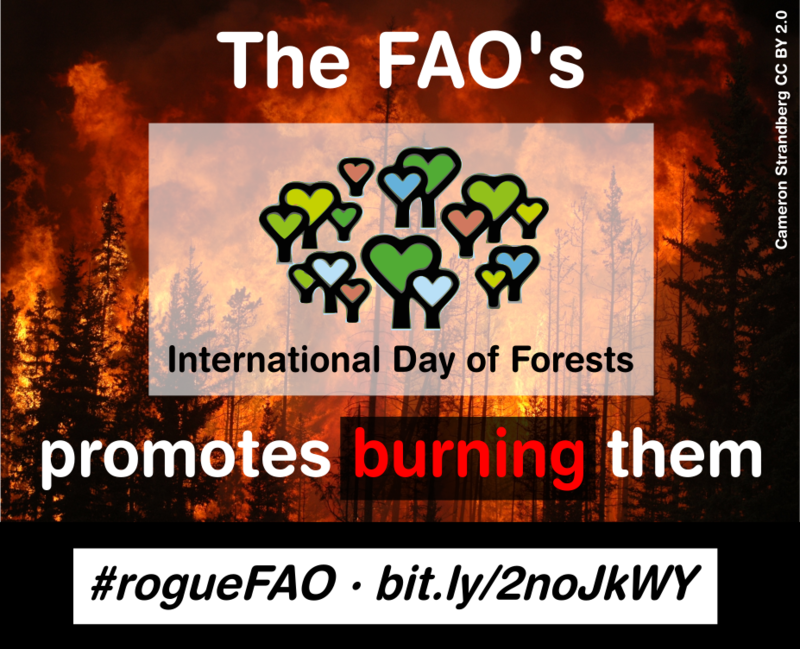 The letter, which was coordinated by the World Rainforest Movement, urges FAO to change its forest definition, which allows industrial tree monocultures to be considered forests. 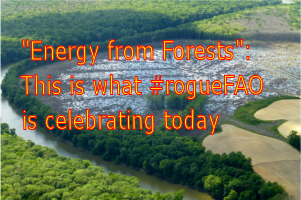 This misleading definition if helping to facilitate the highly destructive expansion of monoculture tree plantations worldwide: wrm.org.uy/highlighted_post/support-the-letter-urging-fao-to-revise-its-forest-definition/ . See here for a blog article about the hand over of the letter at a meeting in Chile: www.biofuelwatch.org.uk/2017/chile-tree-plantation-meeting/. A long list of scientific studies, letters by scientists, and civil society reports and briefings is available at biofuelwatch.org.uk/biomass-resources/resources-on-biomass/ . Below is a short selection of some of those studies and reports.